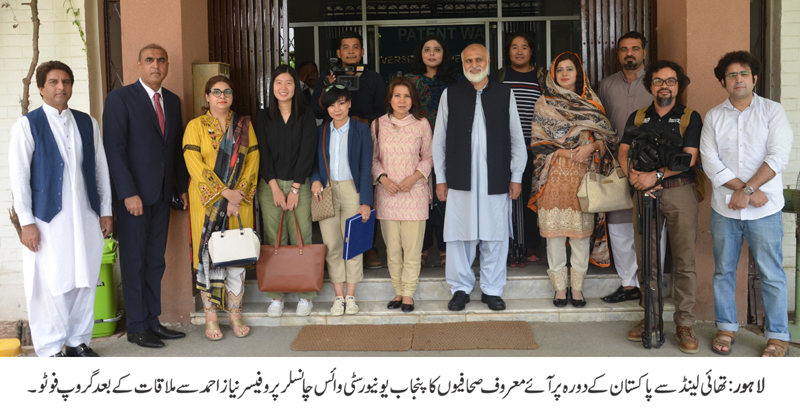 LAHORE: (Friday, July 6, 2018): A delegation of journalists from Thailand called on Punjab University Vice Chancellor Prof Niaz Ahmad at his office here on Friday. Thailand’s news anchor at Channel 3 Dr Runhthip, Editor in Chief of Thai News Agency MCOT Mr Watched in Setkudan, Thai Public Broadcasting Service’s reporter Mr Thiptawan Teeranipong, PU Registrar Dr Muhammad Khalid Khan, Institute of Communication Studies Incharg Dr Noshina Saleem, Director External Linkages Dr Fouzia Hadi Ali and others were present on the occasion. The vice chancellor gave a brief introduction about the PU and expressed his resolve to enhance mutual cooperation between the two countries in different academic areas including journalism. The VC said that the administration aimed at enhancing international connection of PU with world’s leading academic and research institutions and industry. He expressed the resolve that PU would strengthen academia-industry linkages in the field of journalism too. On the occasion, souvenirs were presented to the delegation. The delegates thanked PU VC on providing friendly atmosphere to international students and expressed their resolve to enhance Thailand’s media institutions with PU’s Institute of Communication Studies. Later, the delegation visited PU Institute of Communication Studies where Dr Noshina Saleem briefed the delegation about various sections of the department and academic programs.